We are excited to share with you that the fourteen Judith McNaught titles listed below are available for the first time in E-Book today, November 1st! If you previously read any of these amazing titles, revisiting them in E-Book is not “All for Naught,” as each E-Book will contain original, new content (a letter) from Judith McNaught. 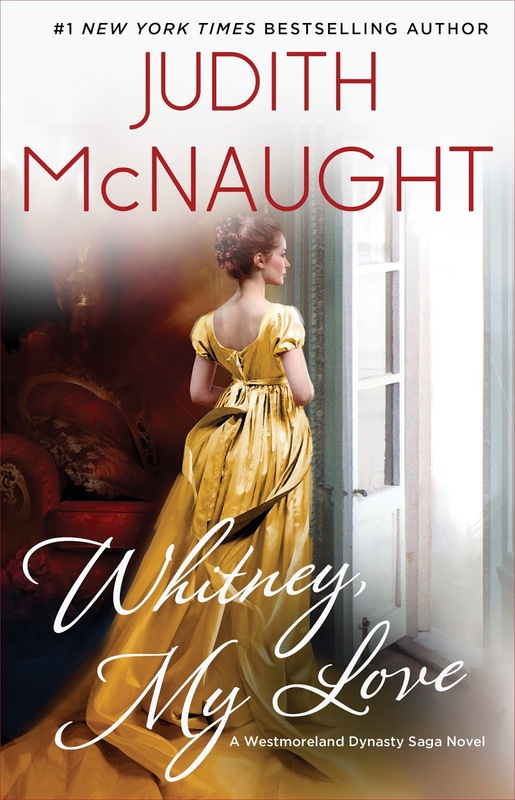 To celebrate this abundance of new material from Judith McNaught, we kick off McNaught-E November today with an excerpt for Whitney, My Love ($2.99 special price November 1st – December 4th, 2016). She lapsed into silence and gazed absently out the coach window at the lush, rolling English countryside covered with wild pink Foxglove and yellow Buttercups, trying to envision the niece she hadn’t seen in almost eleven years. “But Whitney was scarcely five years old!” Anne protested heatedly. As the Gilbert chaise bore inexorably down on the Stone estate, a small knot of young people were waiting on the south lawn, impatiently looking toward the stable one hundred yards away. A petite blonde smoothed her pink ruffled skirts and sighed in a way that displayed a very fetching dimple. “Whatever do you suppose Whitney is planning to do?” she inquired of the handsome light-haired man beside her. Glancing down into Elizabeth Ashton’s wide blue eyes, Paul Sevarin smiled a smile that Whitney would have forfeited both her feet to see focused on herself. “Try to be patient, Elizabeth,” he said. “Margaret, we’re all Whitney’s guests today,” Paul chided. “Margaret!” Paul snapped. “I said that was enough.” Drawing a long, irritated breath, Paul Sevarin frowned darkly at his gleaming boots. Whitney had been making a spectacle of herself chasing after him, and damned near everyone for fifteen miles was talking about it. At first he had been mildly amused to find himself the object of a fifteen-year-old’s languishing looks and adoring smiles, but lately Whitney had begun pursuing him with the determination and tactical brilliance of a female Napoleon Bonaparte. If he rode off the grounds of his estate, he could almost depend on meeting her en route to his destination. It was as if she had some lookout point from which she watched his every move, and Paul no longer found her childish infatuation with him either harmless or amusing. Three weeks ago, she had followed him to a local inn. While he was pleasantly contemplating accepting the innkeeper’s daughter’s whispered invitation to meet her later in the hayloft, he’d glanced up and seen a familiar pair of bright green eyes peeping at him through the window. Slamming his tankard of ale on the table, he’d marched outside, grabbed Whitney by the elbow, and unceremoniously deposited her on her horse, tersely reminding her that her father would be searching for her if she wasn’t home by nightfall. He’d stalked back inside and ordered another tankard, but when the innkeeper’s daughter brushed her breasts suggestively against his arm while refilling his ale and Paul had a sudden vision of himself lying entangled with her voluptuous naked body, a pair of green eyes peered in through yet another window. He’d tossed enough coins on the planked wooden table to mollify the startled girl’s wounded sensibilities and left—only to encounter Miss Stone again on his way home. He was beginning to feel like a hunted man whose every move was under surveillance, and his temper was strained to the breaking point. And yet, Paul thought irritably, here he was standing in the April sun, trying for some obscure reason to protect Whitney from the criticism she richly deserved. A pretty girl, several years younger than the others in the group, glanced at Paul. “I think I’ll go and see what’s keeping Whitney,” said Emily Williams. She hurried across the lawn and along the whitewashed fence adjoining the stable. Shoving open the big double doors, Emily looked down the wide gloomy corridor lined with stalls on both sides. “Where is Miss Whitney?” she asked the stableboy who was currying a sorrel gelding. “In there, Miss.” Even in the muted light, Emily saw his face suffuse with color as he nodded toward a door adjacent to the tack room. With a puzzled glance at the flushing stableboy, Emily tapped lightly on the designated door and stepped inside, then froze at the sight that greeted her: Whitney Allison Stone’s long legs were encased in coarse brown britches that clung startlingly to her slender hips and were held in place at her narrow waist with a length of rope. Above the riding britches she wore a thin chemise. “You surely aren’t going out there dressed like that?” Emily gasped. “B-but why?” Emily persisted desperately. “Because I don’t think it would be very proper to appear in my chemise, silly,” Whitney cheerfully replied, snatching the stableboy’s clean shirt off a peg and plunging her arms into the sleeves. “True. But I can’t very well ride that horse without a saddle and risk having my skirts blow up around my neck, now can I?” Whitney breezily argued while she twisted her long unruly hair into a knot and pinned it at her nape. Ignoring the impulse to snap out a biting retort, Whitney raised her head in a gesture of haughty disdain, then stole a look at Paul. His handsome face was taut with disapproval as his gaze moved from her bare feet, up her trousered legs, to her face. Inwardly, Whitney faltered at his obvious displeasure, but she swung resolutely onto the back of the waiting horse. The gelding moved into its practiced canter, and Whitney worked herself upward, first crouching with arms outstretched for balance, then slowly easing herself into a standing position. Around and around they went and, although Whitney was in constant terror of falling off and looking like a fool, she managed to appear competent and graceful. As she completed the fourth circle, she let her eyes slant to the faces passing on her left, registering their looks of shock and derision, while she searched for the only face that mattered. Paul was partially in the tree’s shadow, and Elizabeth Ashton was clinging to his arm, but as Whitney passed, she saw the slow, reluctant smile tugging at the corner of his mouth, and triumph unfurled like a banner in her heart. By the time she came around again, Paul was grinning broadly at her. Whitney’s spirits soared, and suddenly all the weeks of practice, the sore muscles and bruises, seemed worthwhile. At the window of the second floor drawing room overlooking the south lawn, Martin Stone stared down at his performing daughter. Behind him, the butler announced that Lord and Lady Gilbert had arrived. Too enraged at his daughter to speak, Martin greeted his sister-in-law and her husband with a clenched jaw and curt nod. Bewildered, Anne did as he said. Below on the lawn there stood a group of young people watching a slender boy balancing beautifully on a cantering horse. “What a clever young man,” she said, smiling. With an exasperated look at Martin’s back, Anne tucked her hand in her husband’s arm and together they followed Martin downstairs and outside. Paul Sevarin grinned at her, half in sympathy and half in amusement. “Your niece is on the horse, Lady Gilbert,” he said. “On the—” Lord Gilbert choked. From her delicate perch atop the horse, Whitney’s eyes followed her father’s progress as he bore down on her with long, rapid strides. “Please don’t make a scene, Father,” she implored when he was within earshot. “For the week that we are here?” her aunt gasped, but Whitney was preoccupied watching Paul help Elizabeth into his curricle and didn’t notice the surprise in her aunt’s voice. “Good-bye, Paul,” she called, waving madly. He turned and raised his arm in silent farewell. Laughter drifted back as the curricles bowled down the drive, carrying their occupants off to a picnic or some other gay and wonderful activity, to which Whitney was never invited because she was too young. Following Whitney toward the house, Anne was a mass of conflicting emotions. She was embarrassed for Whitney, furious with Martin Stone for humiliating the girl in front of the other young people, somewhat dazed by the sight of her own niece cavorting on the back of a horse, wearing men’s britches . . . and utterly astonished to discover that Whitney, whose mother had been only passably pretty, showed promise of becoming a genuine beauty. She was too thin right now, but even in disgrace Whitney’s shoulders were straight, her walk naturally graceful and faintly provocative. Anne smiled to herself at the gently rounded hips displayed to almost immoral advantage by the coarse brown trousers, the slender waist that would require no subterfuge to make it appear smaller, eyes that seemed to change from sea-green to deep jade beneath their fringe of long, sooty lashes. And that hair—piles and piles of rich mahogany brown! All it needed was a good trimming and brushing until it shone; Anne’s fingers positively itched to go to work on it. Mentally she was already styling it in ways to highlight Whitney’s striking eyes and high cheekbones. Off her face, Anne decided, piled at the crown with tendrils at the ears, or pulled straight back off the forehead to fall in gentle waves down her back. As soon as they entered the house, Whitney mumbled an excuse and fled to her room where she flopped dejectedly into a chair and morosely contemplated the humiliating scene Paul had just witnessed, with her father jerking her ignominiously off her horse and then shouting at her. No doubt her aunt and uncle were as horrified and revolted by her behavior as her father had been, and her cheeks burned with shame just thinking of how they must despise her already. “There haven’t been so many as all that,” Whitney protested, but she squirmed in her chair. “And Paul’s leg,” Emily pointed out. “He doesn’t care a snap for you is more like it,” Emily replied warily. Sighing, Whitney flopped back into her chair, stretching her legs out in front of her. An irreverent giggle escaped her as she considered the sheer audacity of her last idea. “If only I could have pulled it off . . . you know, loosened the wheel on Paul’s carriage so that it would fall off later, and then asked him to drive me somewhere. Then, by the time we walked back, or help arrived, it would be late at night, and he would have to offer for me.” Oblivious to Emily’s scandalized expression, Whitney continued, “Just think what a wonderful turnabout that would have been on a tired old theme: Young Lady abducts Gentleman and ruins hisreputation so that she is forced to marry him to set things aright! What a novel that could have made,” she added, rather impressed with her own ingenuity. Whitney kept her promise. At dinner that night, after her uncle’s hair-raising tale of their life in Beirut where he was attached to the British Consulate, she murmured only, “How very informative, Uncle,” even though she was positively burning to ply him with questions. At the end of her aunt’s description of Paris and the thrill of its gay social life, Whitney murmured, “How very informative, Aunt.” The moment the meal was finished, she excused herself and vanished. After three days, Whitney’s efforts to be either demure or absent had, in fact, been so successful that Anne was beginning to wonder whether she had only imagined the spark of fire she’d glimpsed the day of their arrival, or if the girl had some aversion to Edward and herself. On the fourth day, when Whitney breakfasted before the rest of the household was up, and then vanished, Anne set out to discover the truth. She searched the house, but Whitney was not indoors. She was not in the garden, nor had she taken a horse from the stable, Anne was informed by a groom. Squinting into the sunlight, Anne looked around her, trying to imagine where a fifteen-year-old would go to spend all day. Off on the crest of a hill overlooking the estate, she spied a patch of bright yellow. “There you are!” she breathed, opening her parasol and striking out across the lawn. Whitney didn’t see her aunt coming until it was too late to escape. Wishing she had found a better place to hide, she tried to think of some innocuous subject on which she could converse without appearing ignorant. Clothes? Personally, she knew nothing of fashions and cared even less; she looked hopeless no matter what she wore. After all, what could clothes do to improve the looks of a female who had cat’s eyes, mud-colored hair, and freckles on the bridge of her nose? Besides that, she was too tall, too thin, and if the good Lord intended for her ever to have a bosom, it was very late in making its appearance. “No, Aunt,” Whitney demurely uttered, carefully placing her hand over the title of the book to conceal it from her aunt’s eyes. “I’m told most young ladies adore romantic novels,” Anne tried again. “Yes, Aunt,” Whitney agreed politely. Whitney nodded, her face flushed with mortification. Now her aunt would think her a bluestocking—another black mark against her. “Also Latin, Italian, French, and even some German,” she confessed. she applied herself to her studies, if she could become more like a son, her father might love her. Whitney was more inclined to think of herself as a chunk of coal, but rather than disillusion her aunt, she kept silent. After her aunt left, Whitney picked up her book, but soon her mind wandered from the printed page to dreamy thoughts of Paul. The world tilted crazily, and for one horrible moment, Whitney thought she was going to be sick. She stopped, trying to steady her shaking limbs, and swallowed back the aching lump in her throat. “Am I going somewhere, Father?” she asked, trying to sound calm and indifferent. Please check back on McNaught-E Mondays (every Monday in November) to enjoy additional excerpts for the other thirteen E-Books. A saucy spitfire who has grown into a ravishing young woman, Whitney Stone returns from her triumphant time in Paris society to England. She plans on marrying her childhood sweetheart, only to discover she has been bargained away by her bankrupt father to the arrogant and alluring Clayton Westmoreland, the Duke of Claymore. Outraged, she defies her new lord. But even as his smoldering passion seduces her into a gathering storm of desire, Whitney cannot—will not—relinquish her dream of perfect love. Rich with emotion, brimming with laughter and tears, Whitney, My Love is “the ultimate love story, one you can dream about forever” (RT Book Reviews). Let New York Times bestselling author Judith McNaught who “is in a class by herself” (USA TODAY) sweep you off your feet and into another time with her sensual, passionate, and spellbinding historical romance classics, featuring her “unique magic” (RT Book Reviews)! For McNaught-E Cyber Monday, we will announce the winner of 14 promo codes, one promo code for each title. This giveaway is international and ends on Monday November 28th. You can enter on all blogs on the tour listed below, but you can only win once. *****Harlequin Junkie: Spotlight Q&A with Judith McNaught! Plot of the book sounds great! Can't join the giveaway because of the many books I have to read. But this one sounds like a great deal. Hope more and more people will join! I am not a fan of this genre but that does not stop me from appreciating the effort of the author to generate interest in her books. First of all, it is hard for me to fathom books not available in ebook format nowadays. I do read books and I would only read if it were ebooks. I love the smell of paper books, but I have since traded them for convenience of tablets. 14 titles, each coupon for each title. I say that is a pretty good offering. The giveaway is only international, haha! Anyway, this books seems to be good for those who love this genre. I really dont read books that much lately. Especially ebooks! They make me sleepy. But i think once in a while its always nice to just read and do nothing else.. i wish to do that. I am no sure when I will be able to pick it up but I will definitely look out for it. The deal seems good coupons for titles. It is really worrisome that present day people have to enticed to read books. She has so many books. I am pretty sure that she has a lot of fans all over the world. My mother would probably be eager to read her books. I think she's doing great for her age because of her books. I have friends who are hopeless romantic and would enjoy her books too. I'm not that really a big devotee of books now a days due to my hectic schedules, especially on ebook. Anyhow, people would love to read this, especially if they love this kind of genre. Thank you so much for sharing about this one. I love a good book that takes you away. Thanks for such a great share and such great detail on this particular book! Hi! I am hoping that this comment will be published in your blog. I love readings and I have a lot in my library shelves. This one is indeed a good deal. However, I love the hard copies more than those books downloaded in my laptop. Sometimes, I get an eye strain that is why I don't love reading stories on the screen. The excerpts of the book arouses the interest. The plot promises to be full of intrigue. A story of human relations and clash and conflicts of egos and of two generations. Looks like a great read. Looks like a nice giveaway. Congratulations to whoever the winner is. The book looks interesting yet intriguing. Definitely a good read. I love Judith McNaught's books!! It would be great to have a bunch of her books to read at my leisure! Thanks for the chance! Judith McNaught writes beautifully! !